I have Aelph-One, you see, and everytime I try to install Eternal (Version 1.03), it says that there's 'already a file with the name you specified. Please rename it.' However, it won't let me rename the files, and if I try to skip it, it won't extract crucial data. There's some weird '3 file' in the folder, but I don't know its purpose. Anyone care to help? Approved your account. Welcome to the Pfhorums! Switch wrote: Approved your account. Welcome to the Pfhorums! Try explaining in detail what operating system you are running, what exact steps you tried, maybe a screenshot of the error message so we're not trying to guess what you did. Nobody can help unless they know what your setup is. Durandal117 wrote: That...doesn't really help me. Try getting help when nobody can see your posts. Treellama wrote: Try explaining in detail what operating system you are running, what exact steps you tried, maybe a screenshot of the error message so we're not trying to guess what you did. Nobody can help unless they know what your setup is. 1. I use windows 7. 2. I tried extracting the contents normally, deleting the '3 file' (it kept reappearing), copy-pasting the data folder (didn't work), running Alephone WITHIN the .zip (dumbass idea)...then I decided to ask for help. 3. I don't have screenshot tools. This is the error I get. If I click 'skip', the data isn't extracted out of the .zip. 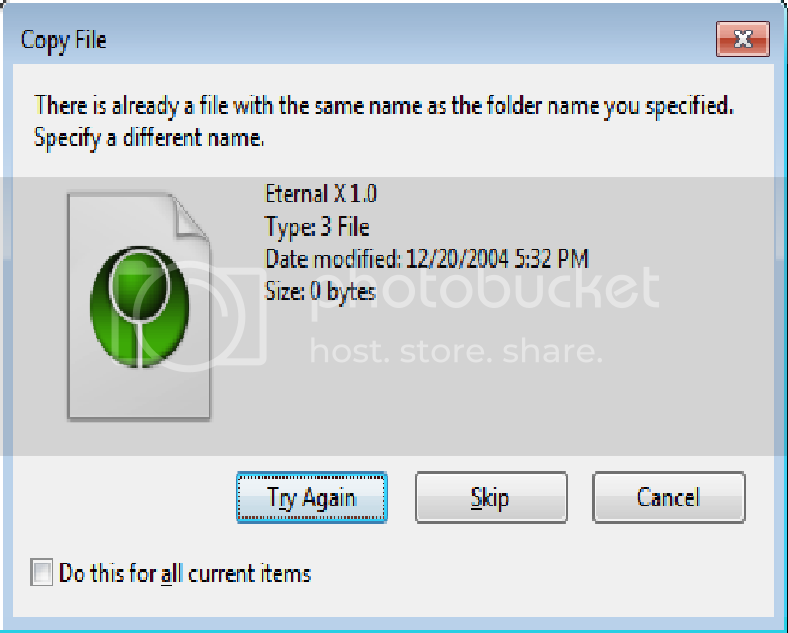 Extract it to a different folder name, just like the dialog box says to do. This isn't a Marathon question this is a basic "how do I use my computer" question. There are probably better forums around for that sort of thing. Last edited by treellama on Jul 19th '11, 18:52, edited 1 time in total. Something tells me you are not doing something right. Maybe you should try extracting ALL the files in the zip elsewhere, and download a separate version of aleph one, and either; A, Place the entire contents of the aleph package in the Eternal UNzipped folder, and click 'yes to all' when ever it prompts, or B, or drag the maps, shapes, images, sounds, and physics files, ect, that you find in the eternal UNZIPPED folder to the UNZIPPED aleph one folder. Durandal347 wrote: Something tells me you are not doing something right. Three people have registered with the name Durandal, followed by a three-digit number. The first two, I will denote by d117 and d347. 117 * 3 = 351. 351 - 347 = 4. 4 + sum(DurandalXXX members) = 4 + 3 = 7. The third member, d819 registered in 2007. I would surmise there is a further connection I have yet to determine. Why are the numbers decreasing, and [what happened?] in 2010 and 2009, such that no Durandal members registered in those years. Is there a connection to 2027? @Tim: Lol, no. I only chose the username Durandal117 because I didn't think anyone else had used it. Anyways, I've solved my problem. Requesting that the topic be locked. Requesting that the topic be loched.